The sultry, modernised funk and soul of Moa McKay & Band — Omni. When I arrived in Berlin in September last year, the first band that introduced me to the lively and wonderful music here was Moa McKay & Band. Whenever they perform, I find myself in smokey jazz bars with authentic Berlin atmosphere and cool, unique interiors. They've previously performed at Barkett, an edgy bar in Schöneberg near Julius-Leber-Brücke where I have previously reviewed Me & The Monster, with a beautiful stage covered in moss. Also performing in Klub de Republik along Berliner Straße, a small performance space at the front of the bar, but with a whole, underground, warehouse area at the back with neon lights and edgy touches. 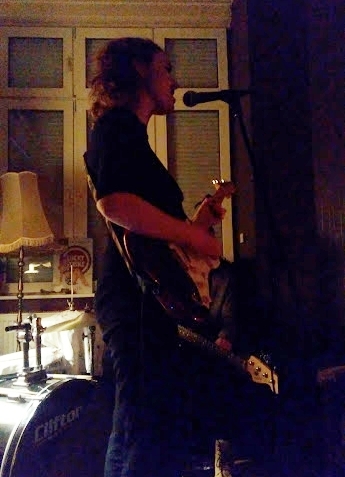 The last performance I attended was on the 26th February in HOME Bar, in Friedrichshain near Ostkreuz S-Bahn station, a sweet and homely bar with a viewing area covered in plush, leather sofas and dimmed, yellow lighting. It set the atmosphere for the smooth vocals of Moa McKay's voice and the deep and sultry jazz tones from her band. Moa McKay is a singer from Stockholm in Sweden, but travelled across to Berlin to study music at BIMM university. With a modernised and refined version of jazz, soul, funk and a splash of R'n'B, her voice belts out into any performance space with passion and power. She can reach quite high pitches, but mainly keeps to low, deep and sultry that convey the emotions of the song and keeps her words clear, clarified and poignant. Her style of lyrical variation is that of the jazz kings and queens before her, but her soulful and playful tone and the funky rhythm of the band gives it a new layer of texture and depth. Her main inspiration is music legend Amy Winehouse, but also is inspired by the works of Ella Fitzgerald, Billie Holiday and Hiatus Kaiyote. She sings mainly in English, but one of her songs Fina Du is in Swedish and is so ripe with emotion, as well as lyrical and vocal variation that the fact I don't understand Swedish doesn't seem to stop me from adoring it. She plays the guitar for this song and a few others too. Moa McKay performing Fina Du. Her and the band's guitarist with English and Egyptian roots, Tristan Banks, are the songwriters of the band. Creating such emotion and depth, from calm and sad songs about the ever-looming depression monster, to an independent, "I-don't-need-no-man" vibe with inspirational lyrics about moving on from bad people and relationships. One of their songs I particularly love is Tramp, which exemplifies being above the selfish, egotistical "tramps" that cause hassle and unnecessary effort in our lives. Tristan Banks himself provides the jazzy chords of acoustic and electric guitar, that generate pure soul and groove. He also does backing vocals that range from synced harmonies to a deranged laugh that add quality and depth to all the pieces. Gabriele Garbin is the drummer of the band, from Bolzano in Italy, who provides the beat and tempo matches the soulful collective and provides the energetic beats that get any audience within their performance space dancing and bopping to the tune. With energy and attitude, it is a driving force in the whole composition. And last, but certainly not least, is the bass player, Per Monstad, from Åfjord, Norway, who adds the deep bass line that provides the groovy harmony and beat underlying the funky tunes from Moa McKay & Band. It adds a sultry flair to each song that is undeniable and glues the overall construction together to accompany the powerful vocals. Moa McKay & Band are gaining notoriety on the Berliner music scene, with multiple gigs that I, and many others, have attended and loved. They have been recording over the past few weeks, where Moa as a lone artist is releasing her EP for her Swedish song Fina Du on the 30th March this year, as well as her collective band that are due to release some songs this summer, including songs Tramp, Another Man and Island Fever.